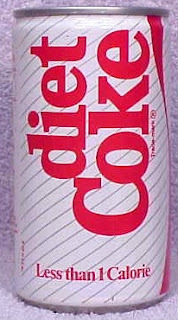 2012 marks the thirtieth (30th) anniversary of Diet Coke, in what was (at the time) the first-ever brand extension of the iconic Coca Cola brand name (they have since introduced flavored versions as well as Coke Zero, but Diet Coke was the first). According to AdWeek, the company will release special, limited-edition cans commemorating the anniversary cans (see HERE ) which are slated to hit stores in early September. Note that Diet Coke is marketed in certain other markets as "Coke Light" (for example, in much of Europe). Coke Light communicates something in languages that don't use the term "diet" as we do in the English Language. I should note that to the best of my knowledge, the Coca Cola (or Coke) brands had never been officially extended prior to Diet Coke, as flavored varieties of Coca Cola like Cherry Coke were largely local soda fountain inventions that weren't adopted [at least officially] by the company until many years later. Indeed, although the 30 year-old diet cola brand is pretty much known as Diet Coke, the earlier cans and bottles also featured the name "Diet Coca Cola" in the company's iconic font (albeit in a tiny version of the font) on the side of the labels and most still do. Coca Cola has always been fiercely protective of it's iconic cola brand, and the formula for the beverage. According to company legend, the recipe is locked in a bank safe deposit vault at a SunTrust location Atlanta and only two individuals at the company even have access to it (or half of it). Needless to say, it's a fiercely guarded secret, although detailed facts coming from the company are done in such a way to preserve the legend of the Coke brand. The so-called "New Coke" debacle from 1985 (hence we can celebrate it's 27th anniversary this year) is alleged by some as a big cover for the mass switch from cane sugar to high fructose corn syrup ("HFCS") which is significantly cheaper. However, Snopes reports (see HERE) that in 1980, which was 5 years before the introduction of "New Coke", Coca-Cola had already begun to allow bottlers to replace half the cane sugar in Coca-Cola with HFCS. Six months prior to New Coke's intro, American Coca-Cola bottlers were already permitted to use 100% HFCS. Whether consumers knew it or not, many were already drinking Coke that was 100% sweetened by HFCS. Anyway, cheap HFCS was definitely NOT in the original recipe, that's for certain, as HFCS only became available after researchers in Japan during the late 1970s developed a highly caustic and corrosive acid that's used to process genetically-modified corn (which itself did not exist until recombinant DNA technology emerged in the early 1980s) used in all HFCS. Hence, HFCS has only been in existence for around 35 years itself. The decision was based on little more than economics, hence the company had no problem altering the secret formula for that. Diet Coke was a radical departure for the company from a branding perspective. Prior to 1982, Coca Cola offered a diet cola known as "Tab" cola, a completely distinct diet cola brand that continues to have loyal fans who can buy it from some local bottling companies even today. Without getting too far off-topic, today's post is not about diet Coke's 30th anniversary, or even about the New Coke debacle in 1985 (although it certainly could be), but about a fascinating clip I from the weekly radio program "This American Life" produced by Chicago Public Media and distributed by Public Radio International which aired on February 15, 2011. I happened to listen to it while I was on vacation recently. Anyway, in that fascinating program, the reporter, Ira Glass reveals what he believes could very well be the secret formula for Coca Cola, but he also talks with historians on the subject, and even provides some interesting background on why Coca Cola has so much sugar (the formula for a small batch of the syrup alone calls for 30 lbs., that's right, POUNDS of sugar) which is because in 1885, Atlanta voted for prohibition, and Pemberton realized that he was going to have to get rid of the wine he used in his drink. So he kept the two other ingredients, the cocaine and the caffeine. People loved those! (Any guess as to why?). Yes, the original formula for Coca Cola contained cocaine (at least it did until 1903). This is big reason Coca Cola has so damn much sugar (or HFCS) in it: apparently, when you mix cocaine and caffeine together, they're extremely bitter. So John Pemberton, Coke's inventor, poured in a ton of sugar to cut the bitterness and voilà, it became Coca Cola. Pemberton called it his "temperance drink" (it may have lacked wine, but the cocaine made up for it). The interview also explains a bit more about the formula, which, incidentally, "This American Life" says can be seen HERE. The story created a bit of an uproar last February , and they explain why they believe their discovery might be legit, talking to historians, and even soda experts such as Eric Chastain and Mike Spear, who are the VP of operations and the marketing director (respectively) at Jones Soda in Seattle. Jones makes primarily "natural" soda flavors like cream soda and green apple. But, apparently, they're also known for being willing to try almost anything, and the company has even made turkey and gravy soda, as well Brussels sprout soda (needless to say, those flavors weren't among their big hits). On the cocaine front, the company has special permission from the U.S. Government (largely because it is grandfathered, having sold a product containing the ingredient prior to laws prohibiting it) to attain the raw cocoa leaves, which are considered a Schedule II controlled substance, and they use a little-known operation in Maywood, New Jersey that's part of the Illinois-based Stepan Chemical Company which removes the cocaine from the cocoa leaves so Coke can still have it's distinctive flavor. No details were provided in the podcast on what, exactly, the company does with the wasted byproduct ... cocaine, although Wikipedia claims it is sold for medicinal purposes to a St. Louis, Missouri-based chemical company known as Mallinckrodt (which was acquired by Tyco in 2001, and in 2007, Tyco spun those healthcare business units off under the name Covidien) which also deals with cannibis and opium. I guess it's an interesting company to work for! I have no perspective on whether the "secret" formula revealed in the program might be legitimate or not, but I can say the discussion was positively fascinating. Have a listen to the podcast (I believe it's about 30 minutes in length, although I have the complete podcast below, and the relevant content is basically the first half, although you're more than welcome to listen to all of it) by visiting HERE (short link http://bit.ly/MjG5Zq). Unfortunately, I initially had some trouble embedding the podcast here (it seems to be working now), but it's definitely worth listening to! You can also download the podcast via iTunes or Amazon.com. As I write this, the cost was less than a can of Coca Cola is sold for (at least where I live) at just $0.99. This particular story was a good one in my honest opinion, and the press release for this podcast (see the press release at http://prn.to/MjPy2V) actually received a wave of international press coverage because they boldly proclaimed they had found the "secret formula" for Coca Cola. You can try and make it for yourself if you're so inclined. You be the judge. I will say that it was a fascinating look into an icon of American pop culture, and for me, the 30th anniversary of diet Coke is a big deal, but for those who like the sugary stuff, or even just details of a closely-guarded corporate secret, this podcast is worth tuning into!